Programming should be enjoyableprocess, but takes a lot of time. 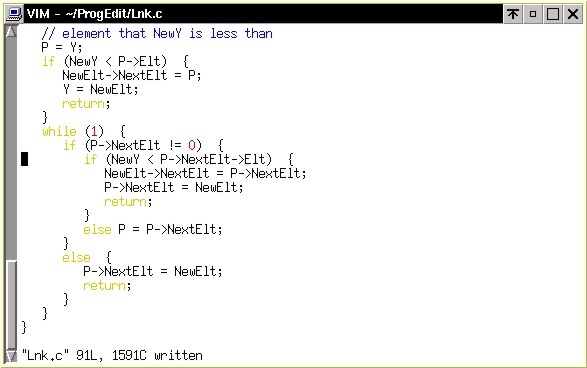 To save time and frustation, make good use of a sophisticated text editor. You should use advanced editor features to help yourself, not to please your professors. Another important way to save time is to learn good debugging techniques. We will use vim examples here. But "You see one, you've seen 'em all": Other advanced editors have similar features. If you have no exposure to vi at all, read my 5-minute introduction to vi. Note that vim also has a nice GUI version, gvim, allowing for mouse operations, clickable icons, etc. To get gvim, invoke vim with the -g command-line option. 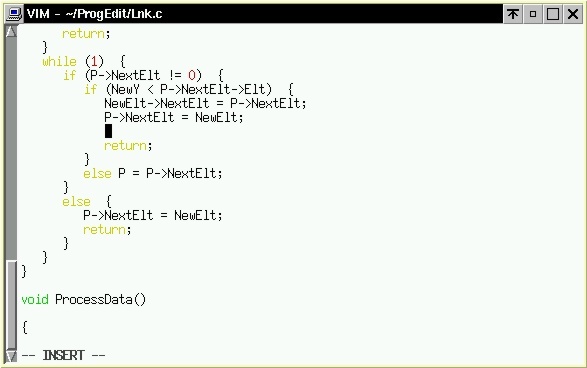 We'd like to check whether we're using the function argument correctly. So, we want to move to the definition of the function. 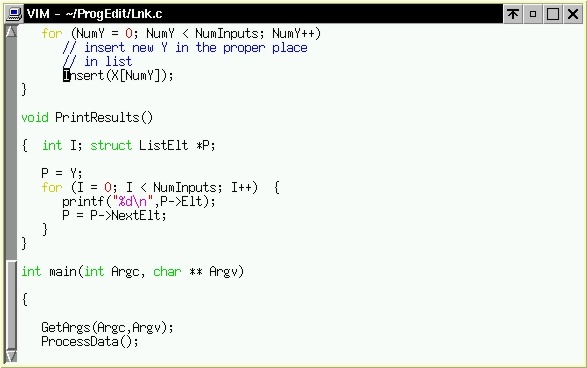 This tells vim to "remember" this spot under the name a. We can save places (and other items) under the names a, b, c, etc., which are called registers. Extremely useful --use them often! You can move the cursor around independently in each of the subwindows. Move to the lower subwindow by typing ctrl-w ctrl-w (or, in gvim, by clicking the mouse in the other subwindow). Type /Insert to go to the call. 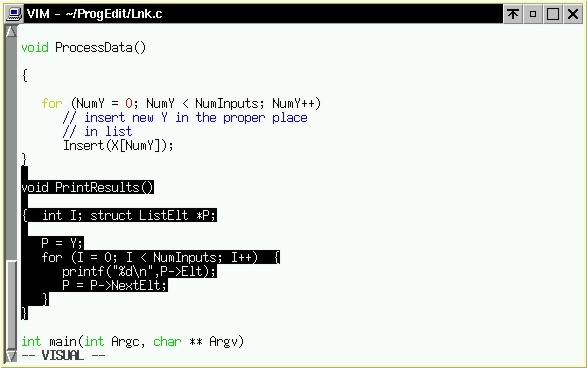 This way we can easily check whether we have specified a function's parameters properly, etc. There are many other settings in which having two subwindows will help clarify our work. The ctrl-w ctrl-w operation toggles, i.e. hitting it a second time will return you to the first subwindow (or will make you cycle through subwindows, if you have more than 2). If I want to go back to using just one window, we type :q in the subwindow to be deleted. Oops! We all make mistakes, but sophisticated editors allow you to undo them---in fact, undo the last N changes you made. A good editor also allows re-do, which means that if you undo something but then decide you want it after all, you can retrieve it. 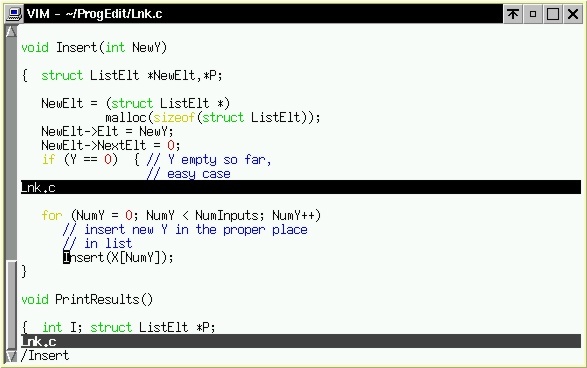 In vim, type u for undo, ctrl-r for re-do. Often one wants to delete an entire set of lines or other region. Though one could do this character-by-character or line-by-line, it is faster and less distracting to apply a single delete operation to an entire region.. Moreover, by using a delete operation on an entire region, this sets up ways to copy or move the region. 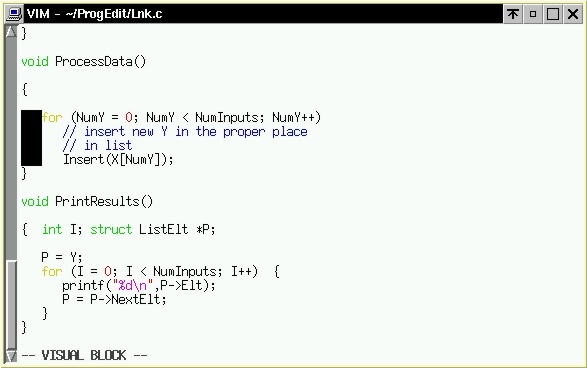 Suppose for instance that we wish to move the function PrintResults() to a position just before the function Insert(). In vim we could first enter visual mode. In gvim, one simply creates the block by dragging the mouse from the first to the last character of the region, upon which the region becomes highlighted. 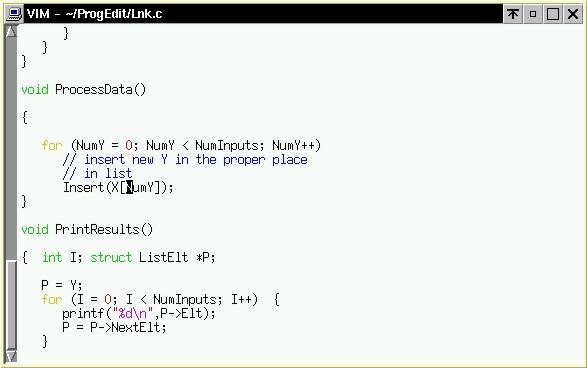 Move the cursor to the beginning of PrintResults(). 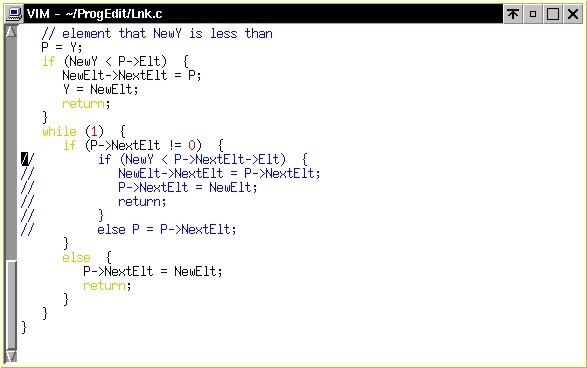 Move the cursor to the end of the function. Now hit d to delete the region. 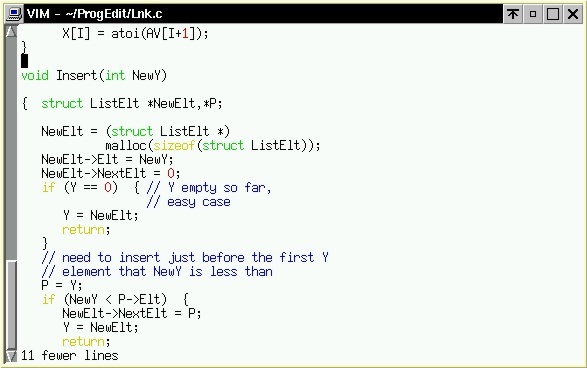 Note that vim (or gvim) has not discarded this region, but instead has placed it in a buffer. 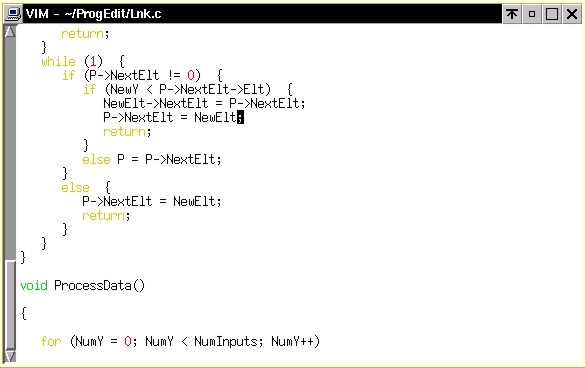 Now hit p ("paste"), and the buffer contents will be placed at the cursor, thus transfering those lines of code. If we wanted to merely copy those lines of code, not move them, we could have deleted the block and then used p twice: First at the point of deletion, to restore the block, and then at the place at which we want to copy the block. In gvim, the GUI version of vim, it is even easier to define the region, simply by dragging the mouse. The v operation is oriented to sets of lines. By contrast, ctrl-v , which invokes visual-block mode, allows you to define rectangular blocks of characters. 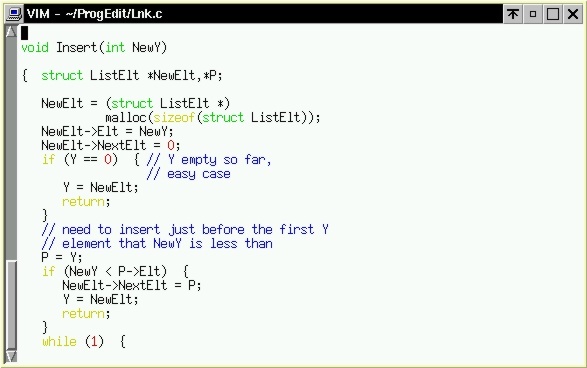 Now hit Esc to end Insert mode as usual -- and look, all the lines are commented out! 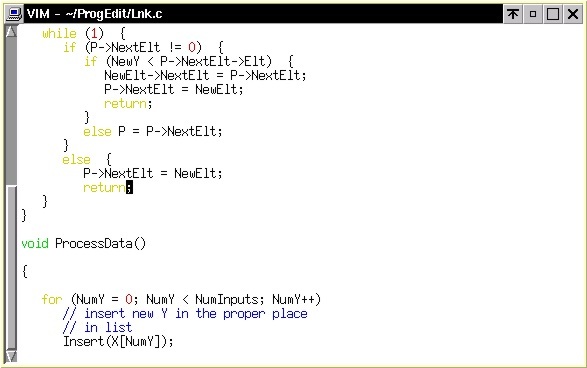 As you know, good programming style includes indenting lines to highlight for and while loops, if-then-else constructs, and so on. But don't indent by holding down that space bar! There are much better ways to do this if you have a good editor. In this mode, whenever you hit Enter to start typing on the next line, vim automatically will indent to the same amount as the previous line. This saved us the trouble of holding down the Space bar for 12 spaces. We can start typing the new line right away, already properly indented. If we want to ignore this indenting on this line, we just hit the Esc key. If we want to leave auto-indent mode entirely, we type:set noai. 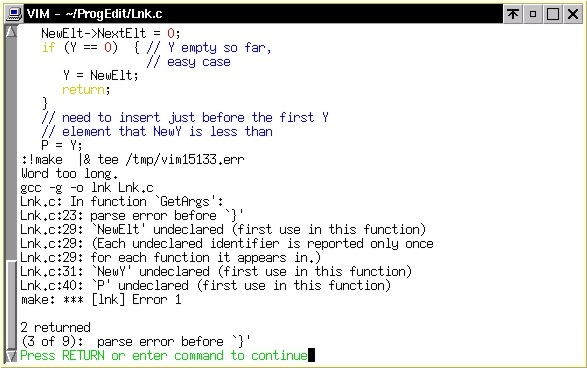 Another powerful auto-indenting comment in vim is the = command. We will not discuss it here, though. 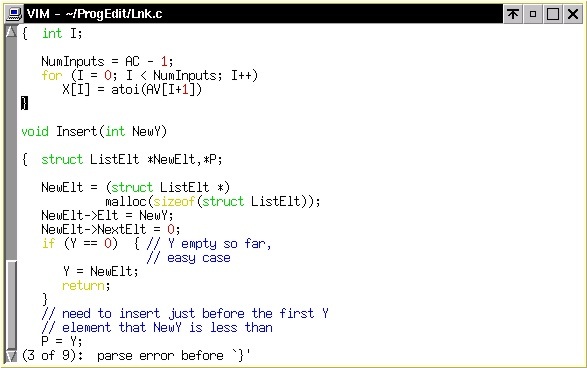 The makefile will be executed, and if there are any errors in syntax, etc. reported by the compiler, vim will relay them to you in the same window as the source code. and from then on, whenever you type "ost" (followed by a space), the editor will automatically expand this to "OverallSalesTotal" for you. This not only saves time, but also again allows you to concentrate better on your programming, instead of being distracted. where here ^n" means ctrl-n. 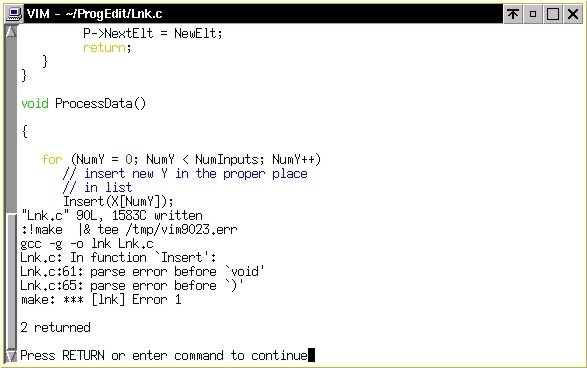 This tells vim to complete "Ov" to the next word in the file which begins with "Ov", which will be OverallSalesTotal. Of course, word completion is handy even when editing text files, say when composing e-mail. 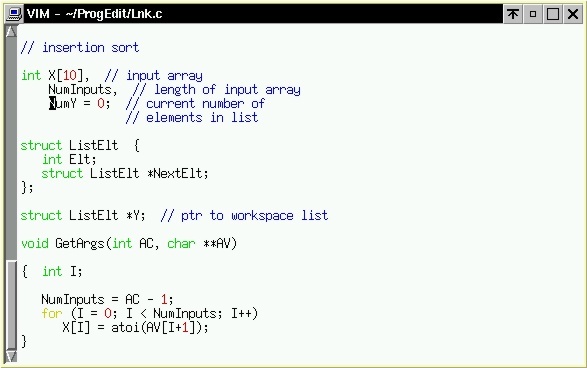 All of the editors mentioned at the outset of this document -- vim, emacs and jEdit -- have this feature. 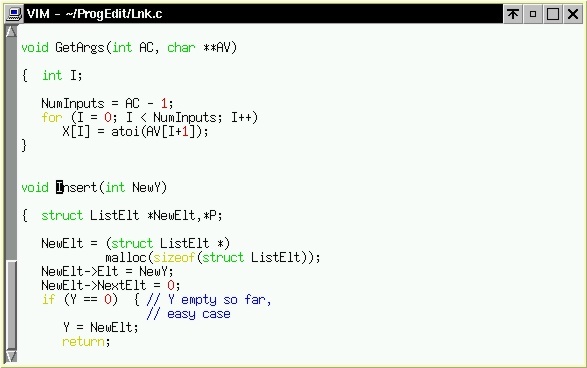 In emacs, for example, it is invoked as C-M / (this is emacs notation for first hitting and releasing the Ctrl key, then the Esc key, then /). Aha! 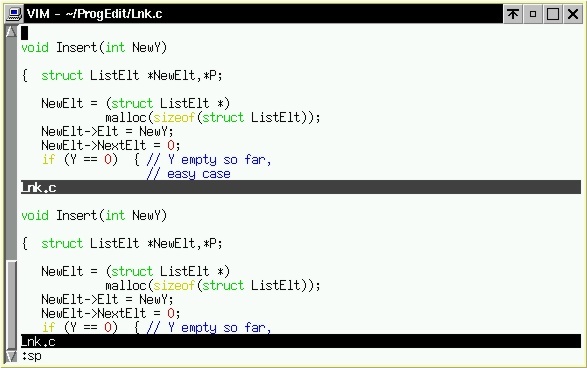 The right brace pairs up with the opening brace of the while loop, not the opening brace of Insert(). In other words, there is a right brace missing somewhere in the loop. A little inspection reveals that it is the closing brace of the second else. 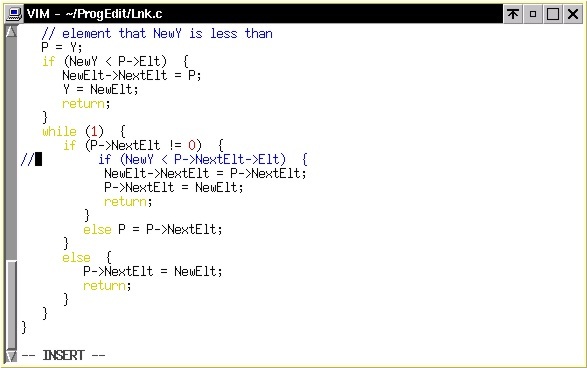 It is a popular feature in many programmer-oriented editors. After you become adept at using the various tricks in a given editor, say vim, why let all that go to waste in your other editing tasks, e.g. e-mail? It makes good sense to use the same editor for all your work. Thus it would be nice to have whatever editor you use for programming work, say vim, as your default editor in your e-mail utility, say pine. That means that whenever your compose a new e-mail message or reply to one you receive, your e-mail utility will automatically invoke vim for your editing pleasure. I personally use the mutt e-mail utility, and I strongly recommend it. But most of you use pine, so here is how to make vim your default editor in pine: When your first invoke pine, first choose S (Setup), then C (configure. Scroll through the choices there until you get to enable-alternate-editor-implicitly; there just type x and an X will appear in the box. (If you check the wrong box by mistake, just type x again to make it disapear.) Then continue to scroll though the choices until you come to "editor". 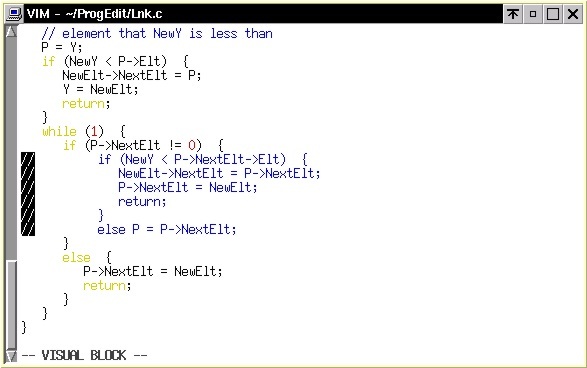 At that point choose C (Change Val) and type vim. 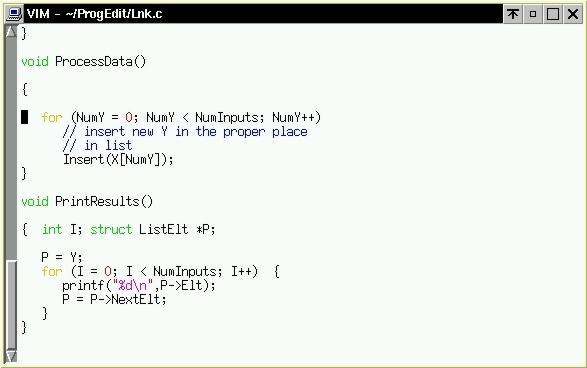 Then choose E (Exit Config) and answer y when asked whether to Commit. From this point on, vim will automatically pop up whenever you compose a new message or reply to an existing one. When you are done composing your message, simply exit vim with ZZ and then send the message as usual. 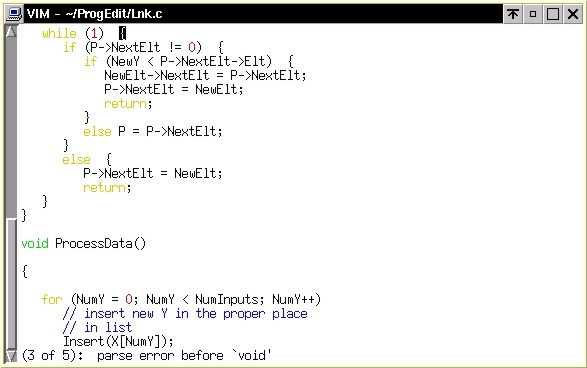 Norm Matloff's guide to fast debugging!